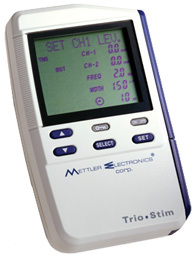 Trio*Stim 215 Neuromuscular Stimulator [ME 215] - $532.00 : Balego & Associates Inc. - BalegoOnline.org, Providing the Products You Want and the Services You Need Since 1984. The Trio Stim is a very unique stimulation device. Although it’s small and portable, it has the capabilities to deliver high levels of output at comfortable levels. Its battery operated so you can travel with the 215 to any location in the world. 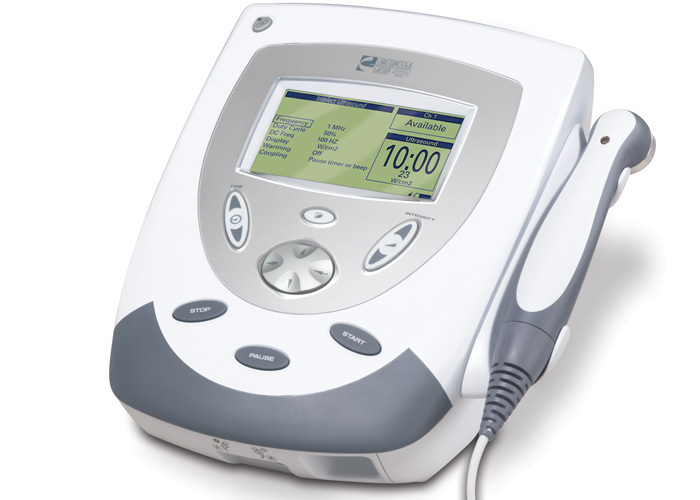 Combining TENS, EMS and Micro-current separates the Trio Stim from the competition. The Trio Stim is specifically designed for the active athlete on the go or the active adult that wants to enjoy the lifestyle that have been accustomed to. Q: Is the 215 just a TENS unit? A: No. The 215 is much more than just a TENS unit. It also offers the EMS and Micro-current waveforms for muscle rehabilitation, muscle spasm reduction as well as pain management for the sensitive patient. Q: Can I use the 215 for functional rehab? A: Yes. The 215 both an EMS waveform as well as a Micro-current waveform. Q: Can I use my 215 in combination with the Sonicator 740 ultrasound to perform combination therapy? A: Yes. Simply plug the 215 into the 740 using a pin to banana adapter and you will be able to perform combination therapy. Q: Can I send my 215 home with my patients? A: Yes. The 215 has a key locking feature that will not allow the patient to change parameters of the waveform. The can only change the intensity. Q: Does the 215 have enough power to achieve strong contractions? A: Yes. The 215 was designed after our clinical models that will allow strong contractions at comfortable levels. Q: Is the 215 a good unit for home health? A: Absolutely. Although the 215 works more like a clinical unit, it is designed for home health applications.